French bulldogs may be small, but they make up for what they lack in size with a pleasant temperament and an adorable, wrinkly face. 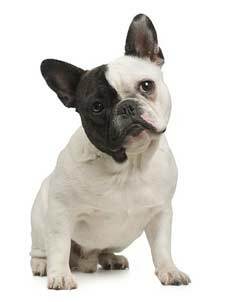 Playful and curious, French bulldogs have stocky little bodies, big eyes and plenty of energy. 1- Perform a visual inspection of the French bulldog’s wrinkles prior to washing, ensuring there are no infections or irritations. Lift the folds of the dog’s skin gently and look for signs of trouble, like sores, redness, a rash or an unpleasant odor. Such issues may be indicative of infection and require the attention of a veterinarian. 2- Rub any visible dirt or gunk from the wrinkles using a damp washcloth. Move gently, applying minimal pressure while still thoroughly cleaning out the dog’s wrinkles. 3- Wash the French bulldog using dog shampoo. Alternately, the Fine Frenchies website suggests using baby shampoo, which is extra mild and unlikely to cause irritation. Rub shampoo suds gently into the folds with your fingers, cleansing them thoroughly. 4- Rinse the French bulldog thoroughly, making sure to wash away all shampoo. Lift the wrinkles apart gently to wash away any remaining suds. 5- Dry the dog’s wrinkles by patting them with a soft cloth. Excess moisture trapped between the dog’s skin folds creates a warm, damp environment in which bacteria thrives, so pay special attention to drying the wrinkles well. 6- Pat baby powder into the French bulldog’s wrinkles to absorb any moisture, keeping the dog’s skin and fur healthy and dry.